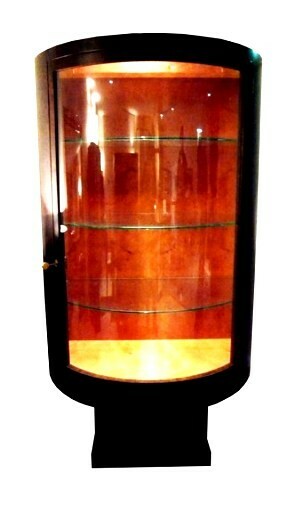 This is a fabulous cabinet with a curved glass front door veneered in American Burl Walnut with an interior of Madrona. The cabinet curves at the front with a crown on top of glass which allows the light to shine into the cabinet from above. The Madrona interior adds a warm rich soft apricot colour and the exterior is a highly figured Burl. The feet, banding, lock and key are all aged bronze.